This helps to use the step-by-step instructional DVD/video effectively and safely. Copyright Dr Paul Lam 2005. Copying for non-profit educational purpose is permitted. For example, you may give your fee-paying students a copy of this article but not sell it to them. Disclaimer: Persons involved in the writing of this article will not be held responsible in any way whatsoever for any injury or consequence that may arise as a result of following the instructions given in this article. Readers are advised to work with their health professionals before commencing these activities. Readers engaged in activities described in this article do so at their own risk. 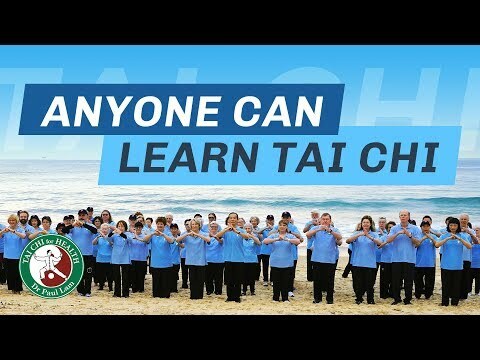 Tai Chi for Back Pain is based on the Tai Chi for Arthritis program. It is designed not just for people with back pain, also those are wheelchair bound and with other chronic conditions. Even for people with chronic fatigue syndrome could use this program. click here for a guide. The Tai Chi for Arthritis handbook can be helpful in learning the main part of this program. Schedule a regular time per day pending on your time available and what your conditions allows you to, say half an hour to one hour daily and stick to doing that no matter what. Following a routine of daily practice will help you adhere to the practice. The best way to benefit and enjoy tai chi is to practice regularly. Whenever you feel you could be over-exerting yourself, use visualization to replace physical practice and check with your health professional at any time. If you can only do a half hour lesson because of a time restraint or physical disability, then do one lesson in two sessions. The lesson plan in the DVD/video is designed for approximately 2 hours per lesson so you should use four half an hour sessions to complete one lesson. If you find the lesson covers too much material for you, then do them with as many sessions as is comfortable for you. If you feel the lessons are too easy, try to refrain from learning faster than suggested. It’s not how fast you learn tai chi that matters. What counts is gaining health benefits and understand the depth of tai chi. Actually, tai chi works better when a person progresses slowly. Be patient and take your time to learn and practice. Once you remember the movements, you can improve your posture, speed and quality of movement. Don’t advance to the next lesson until you’re proficient. If you have a medical condition that prevents you from doing the forms exactly as shown on the DVD/Video, you can use visualization to keep progressing. The general rule: Move to what is well within your comfort zone and visualize whatever you can’t do. You can also adjust your level of exertion by not bending your knees too deeply, by using less internal force and lessening the length of time for practice. 1. Start with the introduction. It explains what tai chi is and suggests general precautions. Take care to follow the precautions. 2. Read “What is Tai Chi?” in the handbook (if you have it). 3. After learning each lesson, practice for several sessions until you proficient before moving on. 4. After the first four lessons, stop for a couple of weeks. Concentrate on revising what you’ve learned so far. Only move on to the fifth lesson after you are comfortable with the Basic Six movements. Try to apply the stabilizer muscle exercises and the internal feeling of the Qigong exercises throughout the Basic Six movements. Practice the this set until you feel right about your flow and rhythm as you practice through the set. 5. When you reach the end of the recording, you can practice with Dr Lam by following him as he demonstrates the whole set with his back to you. 6. Practice this set for several weeks. Then read the essential principles below and follow my suggestions. Tai chi contains essential principles, all of which are fundamental and similar in the different styles. When you concentrate on the principles, you speed up your progress and improve, no matter what style you do. Don’t worry about the minor details. Focus your practise on these principles. In my workshops and videos, I mention these essential principles. Here, I’ve converted them into simple, easy to understand terms. 1. Make your movements slow, even, and continuous, maintaining the same speed throughout. In other words, control your movements. 2. Move as though there is a gentle resistance. Imagine that the air around you is dense and you have to move against this dense air. This will help you cultivate your inner force. 3. Be aware of your weight transference. First, centre yourself, then control your balance, keeping your body alignments, and when you move backwards, forwards or sideways, touch down first, then gradually and consciously transfer your weight forward or backward. 4. Body Alignments. Be sure you keep your body in an upright position. 5. Loosening the joints. It is important to do the tai chi movements in a relaxed manner but relaxation in this case doesn’t mean that your muscles go floppy. You should be stretching, loosening. Try consciously and gently to stretch every joint from within, almost like an internal expansion of the joints. 6. Mental Focus. Be sure not to become distracted from what you’re doing. Focus on your movements so that your internal and external are well integrated. Work on one principle at a time for several sessions until you feel proficient with it. Then choose another principle to practice with. 7. To continue your progression, consider finding a teacher with whom you “click.” Or you might attend one of Dr Lam’s workshops. Also, think of moving on to the “Tai Chi for Arthritis Part II” instructional Video/DVD. Review the tai chi principles regularly. As you progress in tai chi, they will take on a somewhat different meaning. Tai chi’s immense depth comes from its essential principles. You will find that the fundamental principles in tai chi are similar in most tai chi texts and might appear simpler than they are. To appreciate their depth, you must practice. Through practice, you can learn and enjoy the different layers of tai chi’s inner meanings. By now, you might need a suitable instructor to progress further and to help interpret these principles. Read my book Overcoming Arthritis, published by Dorley Kindersley, on how to find a good tai chi teacher. Or read the article on this topic in the Article section of my website. If you’re unable to find a suitable instructor or if you feel your progress might be much different from other members of a class, consider taking private lessons. Feel free to write to me for any advice or information. The best way to contact me is online through my website: www.taichiproductions.com and go to Forum, click Ask Dr Lam. Or email me at service@taichiproductions.com. Or write to: C/O Dr Paul Lam, Tai Chi Productions, 6 Fisher Place, Narwee, NSW 2209, Australia. Best wishes for a healthier and better quality of life. Enjoy the journey.